Millimeter wave (MMW) generation using optical techniques has gained popularity in recent days. 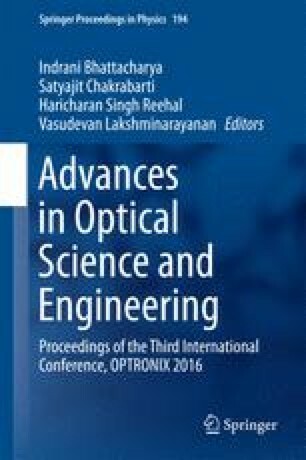 In this work, a 1 Gbps conventional single mode fiber optic link is utilized to remotely generate a 60 GHz MMW signal by heterodyning principle. Two independent distributed feedback lasers (DFB) operating at 193.5 and 194.1 THz, in the transmitter side, are used to generate a 60 GHz MMW signal at the remote receiver. One of the laser is externally modulated by 1 Gbps data and another operating in CW mode, are present in the transmitter side. The important aspect of this approach is generation of 60 GHz RF signal and transmission of 1 Gbps NRZ data, simultaneously in an optical fiber link. The 60 GHz RF signal and digital data are extracted by using a narrow band pass filter and low pass filter respectively. The performance of the data reception and RF generation are investigated by varying the link distance from 10 to 50 km.